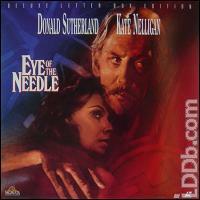 EYE OF THE NEEDLE,US RELEASE ON MARCH 12,1997.WIDESCREEN.DISC HAS FEW HAIRLINES.JACKET HAS MINOR DISC SEAM "EXPRESSION"TEAR AT TOP EDGE. NO OTHER WEAR NOTED.VERY GOOD SPECIMEN!!!! Disc like new. From serious collector. Disc is very good, cover is very good with hole punch.